There is no such force for change like sport. The game we love can inspire change and Nike today present their 2018 Black History Month boot to highlight this message of equality. It has been a tradition for many years that Nike always show their support for Black History Month across all sports. In 2015, Nike released a Superfly BHM and in 2016 it was the Magista they wanted to help inspire change through. This means that the release of this 2018 Nike Mercurial Vapor XI BHM boot will be the third time the world of football gets an exclusive colourway that highlights the fight for a more equal and fair world. Sign up to increase your chances of owning a pair through this link. Good luck! It goes without saying that racism and inequality has no place in the world, but nonetheless both still happen far too frequently. 2017 was a year, where sport took centre stage as a platform to bring to light some serious systemic issues in the world. NFL player, Colin Kaepernick, not standing for the American national anthem was a brave decision that sparked support across all sports. Nike’s stance on the matter is clear and they now give athletes and people an even larger voice in the battle for overcoming inequality. 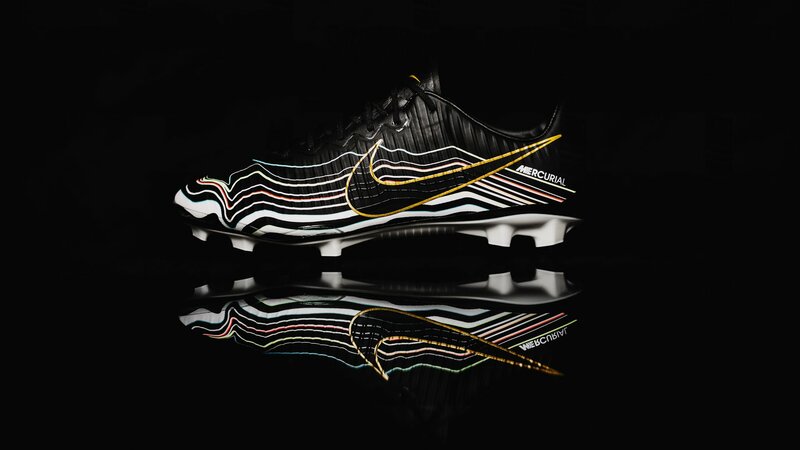 Additionally, the Nike Mercurial Vapor XI Black History Month boots feature graphics derived from cymatics, the visualization of sound waves, drawn from a recording of Martin Luther King, Jr.’s “I have a dream” speech (specifically, his “I have a dream” and “created equal” soundbites). An amazing detail from the Nike team. The Nike Mercurial Vapor XI Black History Month boots will be worn by two football players, who have both been victims of racism of the very worst kind. Dani Alves is famous for being an incredibly cheerful personality and when a banana was thrown at him in 2014, he made the incident famous by picking it up and eating it. He made a very serious situation legendary and after the game made sure everyone knew how condemnable the actions of the racist were. Kevin Prince Boateng has also become a massive figure in the fight against racism in football. While playing for AC Milan, he had an entire match abandoned after the oppositions supporters openly chanted racist abuse at him. This was the first time this had ever been done and it set an important precedent in the world of football and sport. Both Dani Alves and Kevin Prince Boateng will wear the boots on-pitch this week and wear them all throughout February, which is Black History Month. The very limited edition boots will also be made available for purchase, so you too can show your support. They will be incredibly sought after, so be ready on next Monday, where we will put them online on our site. Very fitting since January 15th is Martin Luther King day too. To better your chances of copping a boot that is something very much out of the ordinary, sign up through this link.